There ought to be two sections on betting on snooker - one for how things were in the early 1990s, and one for the state of play by the end of the 2003-04 season. By then, years of mismanagement by snooker's governing body, the WPBSA (now the WSA), had left the sport with an ever-shortening number of tournaments, most of them unsponsored. Indeed, it is questionable whether the term 'season' was the right one to use for the 2003-04 campaign. It implies a time of year devoted to a regular activity, but nine tournaments spread over 223 days at random intervals and comprising just 12 weeks - not including qualifiers - of action can hardly be called regular. So what has any of this got to do with how to approach betting on snooker? More than you might think. Anyone who punts on sport should do their best to have a complete knowledge of the discipline they are following, and it is doubly important in snooker that you understand how the game is structured so that you can comprehend what the players are facing up to. One of the main reasons for this is that current form can be almost worthless in the stop-start campaigns that have been prevalent from 2000 onwards. Form is hard to pin down because the timing of events is so irregular. For instance, there was a gap of one month between the first event of the 2003-04 season, the LG Cup, and the second, the British Open. The gap between the British Open and the UK Championship was two days, but then there was a wait of two months until the Welsh Open. Opposing player A because he played like a prune two months ago can hardly be considered a particularly shrewd idea on its own as there is no knowing what he has been up to since. The same goes for backing player B on the grounds that he was in scintillating form the last time you saw him. Once again, the point needs making that this was not always the case, as the more tournaments there are, the more evenly spread they are likely to be. If the snooker calendar is replenished to its former levels, feel free to give more weight to the most recent form. 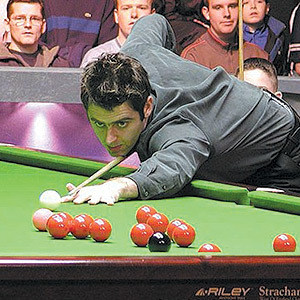 But there was little sign at the end of the 2003-04 campaign that things were going to get much better in a hurry and with snooker seasons as disjointed as they regularly are, form rarely gets a chance to settle down. Players, therefore, drift from one extreme to the other even more often that you would expect. Matthew Stevens making the semis of the British Open, winning the UK Championship a fortnight later and then losing in the first round of the European Open after a break of 60 days is just one of many examples from 2003-04.